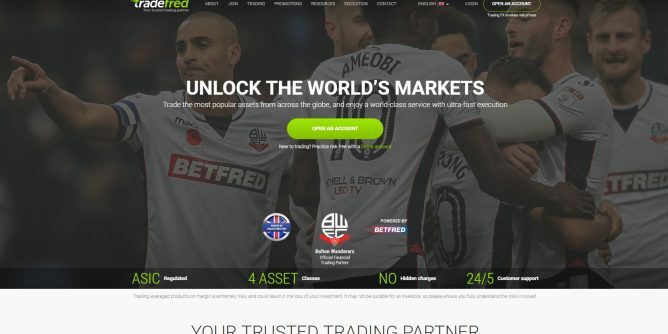 Powered by the BetFred Group, TradeFred is a global online trading platform for Forex and CFDs. Introduced in 2016, TradeFred didn’t have a very impressive regulatory profile in the beginning because it was only authorized by the VFSC, which is the Vanuatu Financial Services Commission). Even though it had its headquarters in the UK, it could only cater to customers in limited countries. However, TradeFred didn’t waste a lot of time in getting licensed and regulated by the Cyprus Securities and Exchange Commission (CySEC). Then, it also got regulated in Australia by the Australian Securities and Exchange Commission (ASIC), which indicates that it is quite serious about being in the forex business. TradeFred has maintained a client-oriented and ethical approach and this has allowed it to provide fast withdrawals, instant trade execution combined with tight spreads and no hidden charges either. You can also find a powerful combination of a customer support system and dedicated personal account managers, which ensures that traders can have an investment career suited to their trading style. Demo Account: This account is risk-free and it provides customers with virtual funds of about $10,000 for practicing trading on their authentic platform and in live market conditions. One of the most notable thing about TradeFred’s demo account is that traders can enjoy unlimited access to it and can use it whenever they wish to practice. In contrast, demo accounts on other platforms are only available for a limited time period. This demo account also gives clients access to a huge amount of educational materials for free and you only need a name, email and phone number to sign up for it. Basic Account: This account type has a minimum deposit of 100, no matter what base currency you choose. You can access educational videos and e-books with this account type. Standard Account: A minimum deposit of 500 is required for opening a standard account on TradeFred and it offers the same features as the basic account, along with free trading signals and narrower spreads, which can be immensely helpful. VIP Account: Last, but not the least, a minimum deposit of 5,000 is required for this account type and it provides all features available in other accounts, along with a personal account manager. Islamic Account: A request has to be made to customer support for opening this account and it can be chosen for any of the three trading accounts mentioned above. TradeFred has configured this account to conform to Islamic Sharia Law, which means all speculative aspects like swaps are removed from this account. Furthermore, a specialist Islamic account manager is provided with this account type for the benefit of customers. By default, TradeFred offers its clients leverage of about 1:50 on Forex as well as CFD trading. But, if clients want to enjoy a higher leverage, they can complete the ‘Leverage Change Request’ form provided and get it approved by the dealing desk. The brokerage boasts one of the richest tradeable asset selection when it comes to the Forex market and offers some of the best trading conditions you can expect. You can find almost 50 currency trading pairs, which not only include the major currency pairs, but also some of the exotic ones. The maximum leverage that traders can get when trading Forex pairs is 1:500 and most pairs can be traded 24 hours a day. The most restrictive leverage is offered in the stock section and is not higher than 1:10. However, this section also offers a diverse asset selection, like the forex market. When it comes to precious metals, traders can choose to trade Gold, Silver and Platinum. The maximum leverage that can be found for these is 1:25. Markets spread out over six continents are covered in the Indices section and competitive spreads can be found here as well. The maximum leverage that has been set for this category is 1:25. As far as the Energies section is concerned, it plays host to Brent Crude Oil, Light Sweet Crude Oil and Natural Gas and the maximum leverage on these assets is also 1:25. The spreads for this category are said to be outstanding. A wide range of assets are covered in the Commodities section such as cocoa, corn, coffee, wheat, soybeans and even Platinum has been included in this category. A maximum leverage of 1:25 is also available here and even though it doesn’t seem very impressive, it gives beginners plenty of maneuvering room and advanced traders can always apply for higher leverage. Like every legitimate and professional brokerage, TradeFred offers the widely-popular MT4 platform to its customers. The MT4 Desktop trader is the most powerful trading platform you can find on TradeFred and it comes with a complete set of charting solutions as well as technical analysis tools that are offered by MT4. You can find a rather impressive range of time frames for displaying your charts and it is possible to customize them. In addition, you can also save chart templates so they can be re-used later by the traders. As far as technical analysis is concerned, there are some 50 indicators that come pre-installed and traders still have the option of installing more indicators if they want, which can be bought or also acquired for free. It is also possible for traders to make their own indicators. One of the biggest strengths of MT4 is its Expert Advisors or EAs, which can be used by traders for automatic trading. Other than that, TradeFred allows its traders to use the MT4 platform for trading CFDs and forex pairs on the same screen. Users can enjoy expert client support and they can also access educational materials and expert market analysis. You can download MT4 directly from TradeFred’s website free of charge. If you are not interested in downloading and installing anything, there is the TradeFred Webtrader available and this is compatible with most of the common browsers available. Moreover, it should be noted that any computer trader can reap the benefits of MT4 by gaining access no matter where they are. Through this platform, traders can also take advantage of expert market reports and analysis. You can launch the WebTrader platform directly from TradeFred’s website. For traders who wish to take advantage of MT4 and its features on the go, there is the option of the Mobile Trader. You can download the apps of the Mobile platform free of cost from the Google Play Store or the iOS App Store. You can use them with any iOS or Android powered devices. Social trading is one of the most popular features that TradeFred has to offer to its traders. With this features, people can form a community where they can share their best practices and successes. Thanks to social trading, traders can participate easily, regardless of their skill levels. This gives an opportunity to experienced traders to impart wisdom while beginners on the platform are able to make better investment decisions with the help of this knowledge. One big advantage of social trading on TradeFred is that it is anonymous so users don’t have to give access to their trading account or disclose their personal details. A major perk of social trading is that it is mutually beneficial for experienced investors as well as novices. There is a copy trading feature on the platform that can be used by traders who have no experience for automatically copying the open positions of successful traders. Clients who are able to attract followers are rewarded for their efforts of helping others. Social trading also provides investors with an added opportunity for hedging their trading risk. Clients have to answer several questions for taking part in social trading as this can be useful for gauging their attitude towards risk. This ensures that investors are protected from trades and people that seem too risky. It also helps in preparing traders for the complete social trading experience. A strict set of rules is followed by TradeFred in choosing investors whose trades can be copied by other traders and they are referred to as the Masters. This ensures the safety of the clients and serves their best interests. When you are using TradeFred, you can make deposits and withdrawals through a variety of debit and credit cards, WebMoney and Qiwi. No matter what method you use for making deposits, money lands into the traders’ accounts instantly. You can also opt for broker-to-broker transfers or bank transfers, but these deposit methods will take at least three to five business days for transferring the money into your account. As far as withdrawals are concerned, they take at least one business day to be processed. Bear in mind that this refers to the internal processing done by TradeFred and there might be delays by banks or e-wallets. 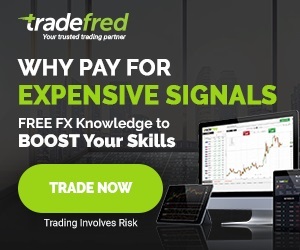 TradeFred provides a complete range of educational resources and it can be accessed by all traders for free. There is also a TradeFred Academy where you can find comprehensive explanations for different aspects of trading as well as that of trading jargon. There is also a huge library of e-books, along with webinars that have online tutorials. Those in the learning phase can apply their knowledge in the risk-free Demo account. The TradeFred website is available in English, Italian and Spanish whereas the trading platform has in-built support and a multi-lingual interface. As long as you are registered on TradeFred, you will be able to access customer support via telephone and email 24/5. You can also take advantage of live chat, but it is only available during regular trading hours. Customers can choose the language they are comfortable with and get support in it accordingly. There is also a comprehensive FAQ page where you can find answers to most common questions and start with trading. As mentioned above, TradeFred is regulated by both CySEC and ASIC, which means it is a very secure platform for trading. The brokerage keeps clients’ funds segregated from the funds of the company itself and they are stored in reputable banks in the European Union and outside as well. Furthermore, TradeFred is also a member of the Investor Compensation Fund, which was introduced by Cyprus law for those investing in Cyprus Investment Firms. The purpose of the fund is to compensate customers with up to an amount of 20,000 EUR in the situation where an investment firm registered in Cyprus fails. Trading via TradeFred provides a ton of benefits to investors all around the world. 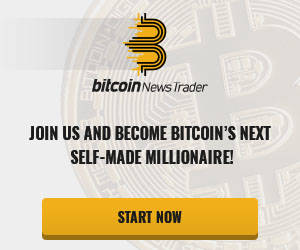 They don’t need to have any experience in the forex or other markets for signing up with this brokerage. They are able to join a community where they can get in touch with their peers and share practices and stories that can be helpful. Likewise, it also gives traders the opportunity to learn from the best. They can ask experienced traders questions about their methods to understand them better. Security is also a priority at TradeFred and they keep user information anonymous and do not disclose their personal data to any third parties. Hence, TradeFred is turning out to be a very solid trading destination for beginners and experienced traders alike. There are different account types available to suit all traders and they can even use the demo account to practice before putting any real money at risk. As the platform is regulated and offers solid deposit and withdrawal option, TradeFred can be an excellent choice for everyone.